RFB Herbie Hancock Ticket Giveaway 8/1-8/4!! 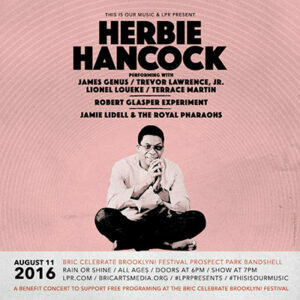 Radio Free Brooklyn is thrilled to announce that we will be giving away five pairs of tickets to see Herbie Hancock at the Prospect Park Bandshell on Thursday, August 11th. The tickets will be given away on Brooklyn Bandstand, our daily live show featuring the best local music, on Monday-Thursday, August 1-4, from 4-5 PM. One pair of tickets will be given away per show. You can also tune in to Ear Hammer with Rommel Wood, who will be giving away a pair of tickets on her show on Wednesday, August 3rd from 8-10 PM. You MUST be listening to win, so make sure you’re tuned in to Radio Free Brooklyn, and listening for the host’s instructions on how to claim your free tickets!